Photo by rawritzrichii, seek permission before reposting. One continual issue with the Kagerou clan is that retiring as a mechanic is expensive. Berserk Dragon costs 2 counterblast for a -1 to the opponent; Kimnara and Gattling Claw both take 1 counterblast for no net difference in advantage. Overlord takes an entire counterblast 3 by himself to probably get the front row cleared out. While the control-based mechanics of the clan are appreciated heavily by the pro scene, the ratio of what you pay compared to what you're receiving isn't always equal and can be difficult to maintain across an extended game. The Amber Dragon deck is the purported solution to this. Unlike the majority of Kagerou cards, the Amber Dragon line is lifted wholesale from the mechanics of other clans, coming out of EB04: Eclipse of Illusionary Shadows. The skills of the Amber series are a Fullbau-based evolving line, with the grade 0 Amber Dragon Dawn automatically adding the grade 2 Amber Dragon Dusk to your hand when ridden over with the grade 1 Amber Dragon Daylight. Each Amber Dragon gains power in the vanguard circle for having the previous member in its series in the soul; the base 6000 Daylight becomes a base 8000 unit, the base 9000 Dusk becomes a base 10000 unit, and the base 10000 Eclipse becomes a base 11000 unit. For grades 1-2 this effectively lets you have eight types of base 8000 unit to ride and five to six kinds of base 10000. Furthermore, when you call Daylight to the rearguard you can discard any grade 3 Kagerou to add the final member of the series, Amber Dragon Eclipse, to your hand. So the subgroup is a defensive powerhouse and comes with grade security, but there are disadvantages to this setup. First, since this predates the creation of Riviere and the modern evolution line, there is no compensation for missing your Daylight ride. Dawn will simply sit in the soul. Dawn is the only real alternative that Kagerou has to Conroe up until BT11, and because of his inability to leave the soul, he most directly favors the soul-heavy builds of the Vortex and Blazing Flare Dragons. Unfortunately, this means losing out on Conroe's search skill, significantly decreasing your chance to superior ride Blazing Flare when fusing the two decks. Dawn's skill also comes with coinflip odds to go off; he's in an unfortunate position, as a more consistent Amber Dragon deck would synthesize strategies by using Conroe with Daylight purely as a way to search Eclipse, and four copies of Dusk to more reliably trigger than continuous +1000 power. Aside from the basic setup of the Amber line, the grade 2 Dusk is where the deck's unique skills first debut, gaining +2000 power when he attacks from the vanguard circle. This forms an easy 20-22000-power line with Bahr or Raopia--both of whom Conroe can search in the first place--partially answering gradelock just as Doranbau and Blaster Dark did for the Shadow Paladins. Also unlike his contemporaries, if you miss your Daylight ride, Dusk will be able to go for 11000 power on-attack, while the others would hang around and 9000 and most likely need to call a boosting unit. To discuss the cornerstone of the deck, Amber Dragon Eclipse is like other BT04-era vanguards, a base 11000 unit when his grade 2 form is in the soul. 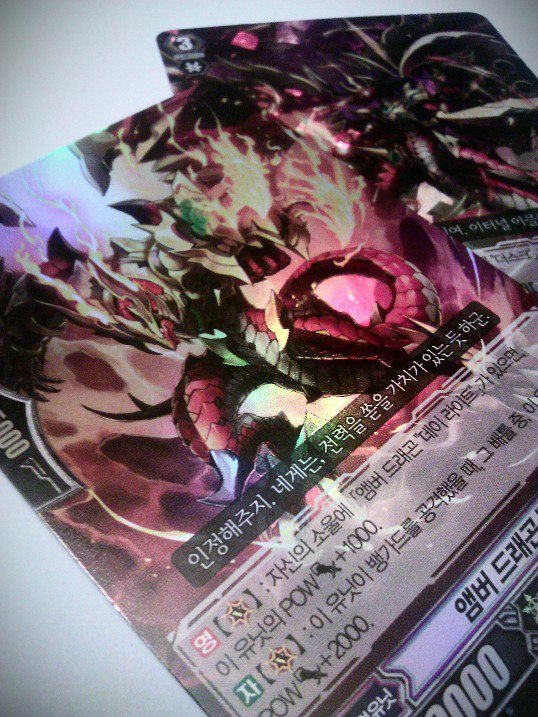 His skill is something of a combination between Phantom Blaster Dragon and Evil Armor General, Giraffa. During the main phase, Eclipse's counterblast 2 gives him a new skill; when his attack hits, Eclipse can retire up to two of the opponent's rearguards. A -2 to the opponent for CB2 is a very good deal, and the on-hit requirement is not as difficult as it may initially appear. The low cost means that Eclipse can pressure the opponent to defend earlier when they have yet to really build up their resources, and before many skills have gone out, at a point when the opponent likely has a smaller field that caters to Raopia going for 21000 with Eclipse. This is a little redundant since generally you would want the opponent to have more cards on the field to give you more options for what to retire, but as long as there are at least two rearguards out, the activate can be made worth investing in. Since Raopia's requirements and Eclipse's number of retire targets coincide, these two are natural partners. The main issue with this is then the wedding ring that it places on your counterblast, offsetting the direct advantage that Eclipse gets you when compared to Giraffa, Phantom Blaster Dragon and Stern Blaukluger. It's difficult to justify dedicating that counterblast 2 for a skill that's ostensibly not going to go off very often, but EB01: Comic Style Vol. 1 will introduce a remedy to this. For now consider that Berserk Dragon is not strictly necessary to the Amber Dragon deck, because Eclipse connecting is so much more valuable of a maneuver. One way to assist in supporting Eclipse is with Garnet Dragon, Flash. Flash is a base 9000 grade 3 who when his attack hits, can give +3000 power to one Kagerou unit on the field. With this Eclipse can go for 21-22000 with Bahr or 20000 with Raopia when his skill is inactive. The opponent can answer this by guarding Flash, but then they have to contend with choosing between placing down enough cards to stop one trigger to guard Eclipse while at low damage after having already spent resources on Flash. Eclipse's strengths shine when the fight becomes a game of bad choices. There is somewhat more room in this deck for Lava Arm Dragon than there is for Iron Cutter Beetle in the Giraffa deck or for DonnerSchlag in the Shadow Paladin deck. The reason for this is that unlike these decks which have Master Beetle and Dark Metal Dragon, the pure Amber Dragon deck does not ever make use of alternative grade 2 or 3 vanguards intentionally, and that with Berserk omitted there is considerably more space available. Lava Arm forms 17-18000 lines easily for face-offs with Majesty Lord Blaster and crossride decks, but as with any rearguard of this type, one should be wary of riding it and getting a base 5000 vanguard. What Eclipse lacks in offensive sweeping and endgame power it makes up for in early pressure and cheap costs. Despite the dedication Eclipse requires on its counterblast, the skill is easy to pay and is only going to get easier to do so as later sets are released. It's valuable for forcing the opponent to choose between early defense or an early loss of formation, and while putting the decisions in the opponent's hands is generally not sound strategy, in this case most of the moves that they can make are bad ones. Five pros use this deck.